I’ve had an iPhone since the first model and, over time, I've accumulated a lot of apps. 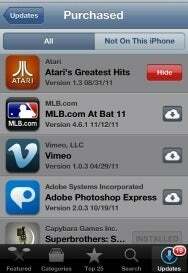 When I look at the Purchased items on my iPhone or within the iTunes Store, I see a lot of apps that I no longer use. Is there any way to make them disappear? iTunes: Click the iTunes Store link in iTunes’ Source list, go to the Home screen, and log into your iTunes account if you’re not already logged in. In the Quick Links area click on the Purchased link. In the resulting screen click on Apps. Move your cursor over any apps that you want to hide and click on the X that appears in the top-left corner. You’ll no longer see this app within the iTunes Store's Purchased screen or in the Purchased screen of an iOS device. 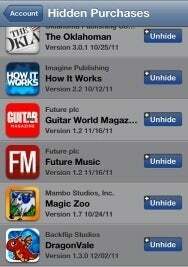 iPhone and iPod touch: Tap App Store and then tap the Updates button at the bottom of the screen. At the top of the Updates screen tap Purchased. Locate an app you want to hide and slide your finger across its name. A red Hide button will appear. Tap that button to hide the app on all your iOS devices and in iTunes. iPad: Tap App Store and then tap the Purchased button at the bottom of the screen. Swipe across the app that you want to hide and tap the resulting Hide button. You now know what this Hide button does, but it’s also important to know what it doesn’t do. If you have a now-hidden-to-the-Purchased-screen app on your iOS device, hiding it within the Purchased screen will not remove it from your device or prevent the App Store from showing updates for it—which is too bad. I’d love to see a feature that allows you to hide updates for apps you've hidden so that you can keep the version of a particular app you have (because you don’t want the update for one reason or another) while still easily downloading all other offered updates. That isn’t what this feature does. In iTunes log into your account by clicking on your account name in the top-right of the iTunes window. In the iTunes in the Cloud area click on View Hidden Purchases. Select the Apps tab in the resulting screen and click the Unhide button that appears next to each app you want to now appear in the Purchased screen. On an iOS device launch the App Store and tap either the Featured or Top Charts/Top 25 button. Scroll down to the bottom of the resulting screen and tap the Apple ID button. In the window that appears tap View Apple ID and enter your password. In the resulting Account screen scroll down and tap Hidden Purchases. Tap the Unhide button next to those apps you want to unhide.